We had fun – bbq, soccer, and fireworks! The show was spectacular! Ana freaked out a time or two, but we got through it. Those Boomers really frightened her. This was one of those, “Get me out of here!! !” moments. Last week I mentioned that I found ladyfingers (a real tough item to find around here) for 99 cents a box. I bought all the boxes that were left on the shelf. Since then I have made a Tiramisu cake three times. I also made Tiramisu Ice Cream. 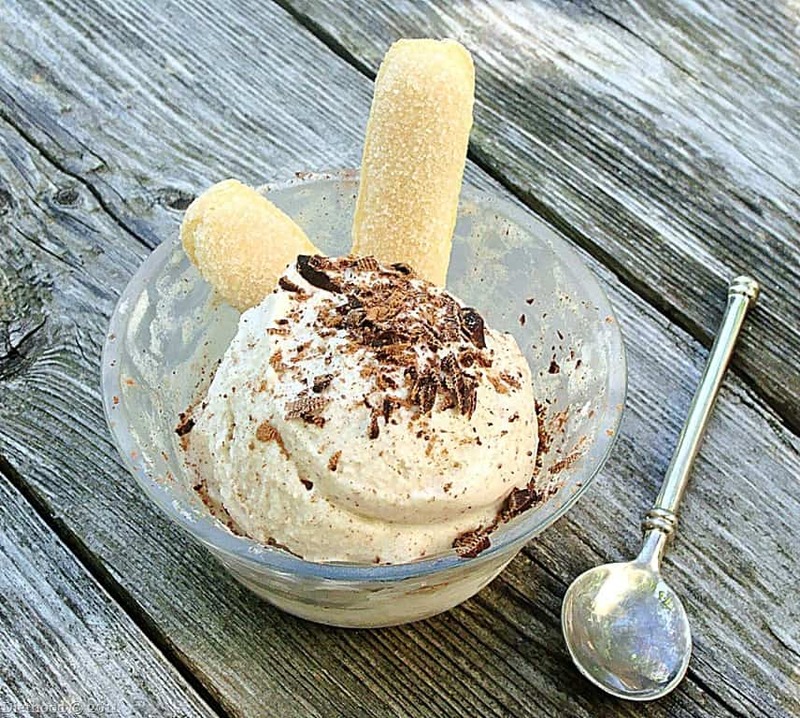 After some trial and error, I think I made the best Tiramisu ice cream you will ever have! I know, that sounds like I’m trying to sell it, BUT it really is delicious! There’s a hint of chocolate, a bigger hint of booze, and just a dash of espresso coffee. And it’s frozen and creamy! One more thing… please, if you can, be my guest and photograph ice cream outside when it’s 90 degrees. Then let me know how it goes. In a food processor, or blender, bring together the mascarpone cheese, milk, disaronno amaretto, sugar, and salt. Puree until the mixture is blended and smooth. Put the mixture in the fridge for an hour. Pour the mixture into an ice cream maker and process according to manufacturer’s instructions. In the meantime prepare the espresso and chop up the chocolate square. When the espresso coffee is done, drop in the chocolate bits and stir until melted. In the last 5 minutes of freezing, and while the ice cream is churning, pour the espresso into the ice cream one teaspoon at a time. Turn off the machine and transfer the ice cream to an airtight container. Put the ice cream in the freezer for another 4 hours, or until firm. Top with cocoa powder and chocolate shavings before serving. That third photo looks like a flower…a delicious tiramisu flower…. O M G. It isn’t even done churning and this ice cream is SO fabulous! I used 2T amaretto and 1T Godiva chocolate liqueur. I had four ladyfingers left over from a tiramisu I made last month so I chunked them up as a perfect add in for the ice cream. Thank you, thank you, thank you for sharing! I found this the other day and told my wife we were making it, and so we did this weekend. It was out of this world, totally tasted just like tiramisu! I only encountered one small hiccup, thought I’d share. I added the lady fingers to the mix in the last 5 minutes, and because I am very literal when following directions, I dropped them in whole. They started to jam the machine, so I had to turn it off for a second and break them up into smaller, manageable pieces. Lucky for me I added them slowly, so I only had 2 in there before I realized it. Once I broke them up, it worked great. Oh, and if you are an evening (before bed) ice cream eater like us, you may want to consider replacing the esspresso with strong decaf. I didn’t try it with decaf, because again, I wanted to do it just as is the first time. 5 starts out of 5 though, amazing ice cream. If you have an ice cream maker, you should make this. If you don’t, go buy one, and make it. Hi Matt!! Thank you so much for sharing! I am sooooo glad you loved it!! Yum, Yum, Yum! 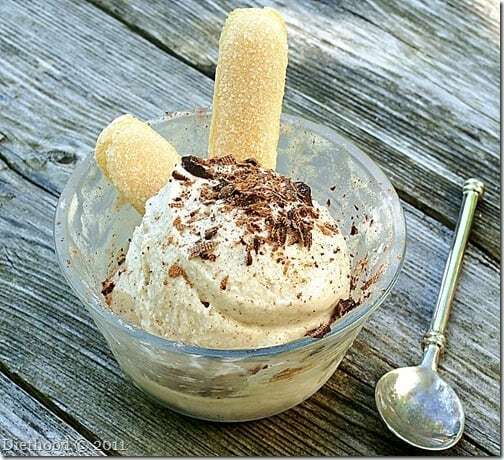 I don’t think I have ever seen tiramisu ice cream. A genius idea in my mind. This looks so good. You know I need to do this now. Kate! First, congrats on Top 9!! Second, I love the idea of ‘recycling’ a delicious dessert into ice cream fantastic. And finally, I totally feel your pain on the challenge of iced-treat photography when it’s hot out – nothing to be done but move like lightening or give in and eat away. Oh wow…this looks AMAZING! I think I need some stat! Perfect recipe to try out in my new ice cream maker I think….and congrats on top 9! Kate, I like the even bigger hint of booze 🙂 You’re amazing and so is the tiramisu ice cream – wish I lived closer, I could have helped you with the photo session by eating the ones that melted. Congrats on the Top 9! Yummmyyy!!! What a clever idea. And congrats on Top 9 today! Congratulations on your Top 9 today!! I just got a gelato maker and can’t wait to try this recipe in it! Yeaaah you’re in top 9!! Congrats!! Oh wow. This looks rich and delicious. Another excuse for amaretto too. 😉 Great pics too! LOL the melted ice cream picture is so cute! This sounds amazing- and I love the tiramisu kick you have been on lately kate. I have a terrible story! My son wanted me to try this so I bought everything! Today I went to make it, I had left the mascapone cheese in the trunk 🙁 it wasnt good anymore, smelled pretty bad! So I have to buy more that small batch cost me 5.99! My luck the most expensive thing fell out of that stupied recycle bag! oh well had to share that we cant wait to try this… have to wait for my next day off! Thanks for the recipe, glad you tried it more to make this as perfect as it looks! xo thank you!!!!! Oh no!! 🙁 I hope you get a chance to make it… it really is incredibly delicious! This looks fabulous!!!! I can’t wait to try it! These are great pictures and looks delicious!!! Hon, I think you have scored a huge hit with this one! This is even easier to make at home than Tiramisu itself! I kind of like the melted photo myself, that way you can eat it faster. 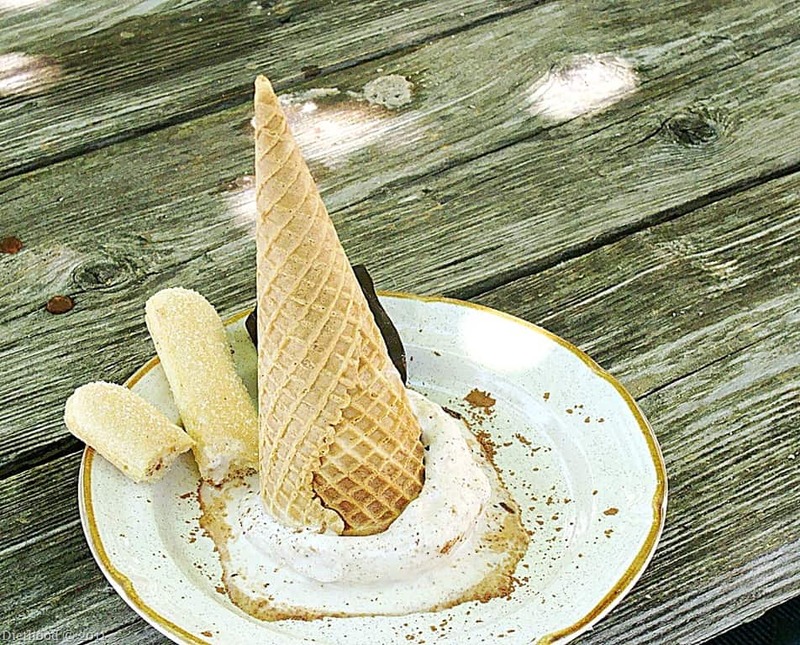 Such a great idea for ice cream and now that I have a maker, I can’t wait to try this. I love tiramisu anything. Too bad you don’t live closer. That’s definitly a great ice cream! If i love tiramisu i’d surely love this ice cream! Girl, this is the BEST use of all those soon-to-expire lady fingers!!! Honestly, I just want to SQUEEZE you for this one! It sounds completely irresistible! Great going, Kate! 3xtiramisu weekend sounds fabulous and well done on the photos in that heat. Love the last photo! Too funny but it still looks incredibly delicious. What a great twist! I love it when classic desserts are made into ice cream. Holy Cow! I want to live at your house….Tiramisu and Tiramisu ice-cream? You are a goddess! Buzzed it hoping for a Top 9 on this one! 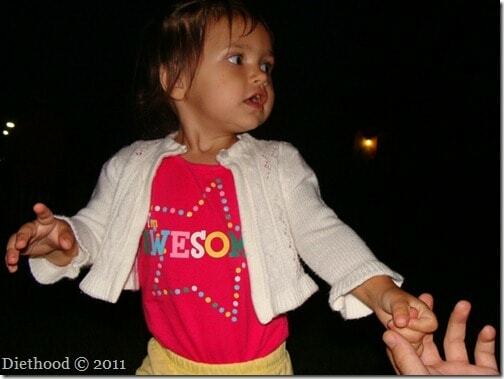 First of all, your daughter is adorable!! The ice cream looks fantastic. I’m glad you are getting the most out of those 99 cent lady fingers! This is really great ice cream! 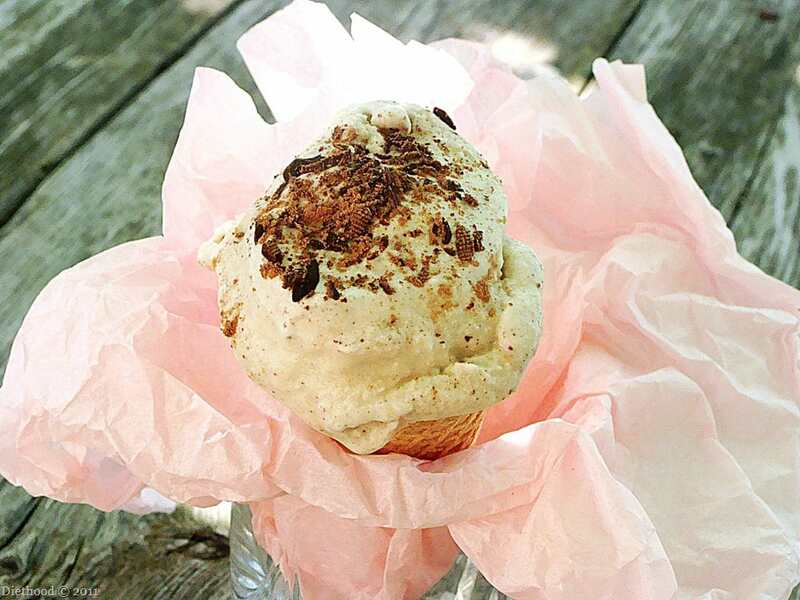 I love tiramisu and I definitely love tiramisu ice cream. Sold! 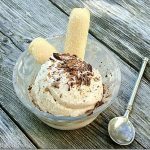 I have truly and honestly been looking for the best tiramisu ice cream recipe! Also- I feel Ana’s pain- I was just about the jumpiest kid growing up and fireworks were way more than I could handle. Ok, still a little more than I can handle…I was up until 4AM with all the noise from people shooting off fireworks in our street. Hope you are having a wonderful week and glad you enjoyed your holiday weekend! Um, holy yum. This looks fantastic! 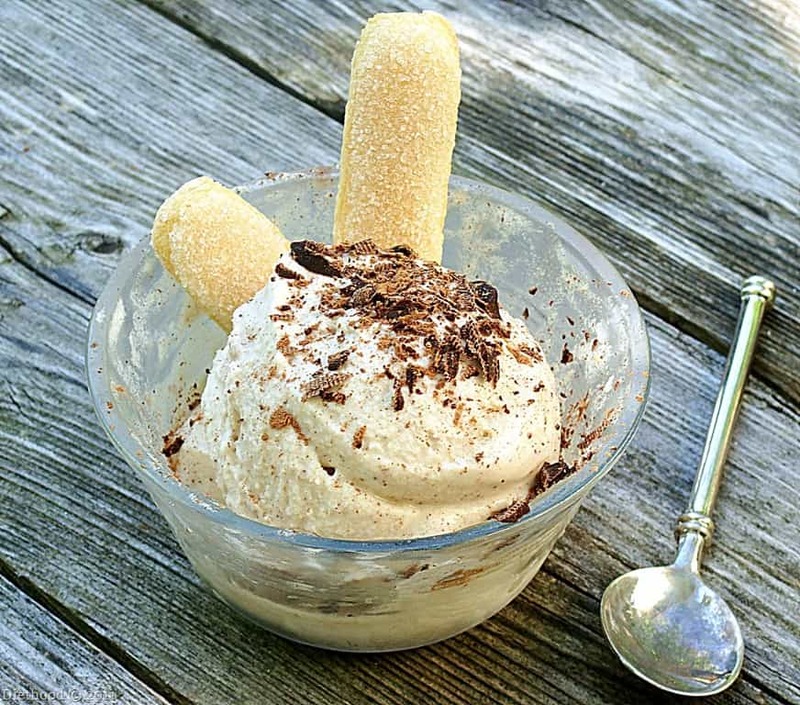 Kate-What a creative idea to make tiramisu ice cream. You really got good use of the lady fingers: I love the pic of melting ice cream. It reminds me of a melting snowman. The photo that’s all melty is my favorite one, I love it already! I have saved this recipe-it sounds simply delicious. The ice cream in the dish looks awesome-in spite of the weather. thanks so much for sharing! I feel your pain. I scrapped a post on my Dad’s pistachio ice cream just because I could not get the ice cream to not melt. I’m adding this to my ice cream rotation ASAP! Gosh that sounds really good. Mouth is watering now! that is one tasty looking ice cream and perfect for this hot summery weather we are finally having! This looks sooo good! Definitely the first ice cream I’ll make when I finally get an ice cream maker! Oh lady, these are so going to be made at our house. Regarding the picture in 90 degree heat, I just consider that a waste of good ice cream. That amazing-looking ice cream is more important than foodgawker in my book. wow tiramisu ice cream is a first for me! never seen anything like it. you sooo creative kate! I love making ice-cream, and have been on a roll making my own for the past few weeks (9 flavors so far). I can’t wait to try this. By the way $0.99 for lady fingers is DIRT cheap! Great job.